Last week we let you know that Crisp had come out with a new sandwich, the Crisp Asia. I’ve often wandered by, wondering if Zach was correct in stating that they have some of the best falafel in the city (Serious Eats says no.) More often than not, this was after “eating” at Muldoon’s with so much Guinness hamburger in my stomach, I never could stop- that is until they decided to put Mandarian oranges and falafel together, as one, in unity. Crazy talk-I must try it. I have to say Zach was right; this chainy, yuppie, pricey falafel is quite worth it. 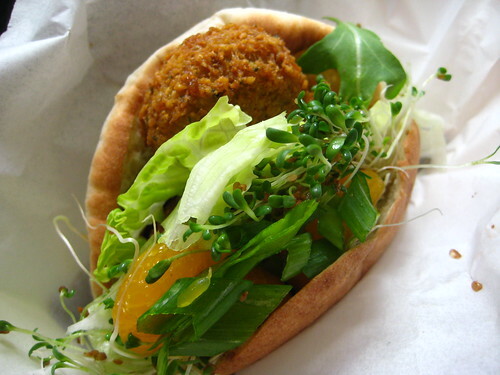 The falafel balls are freshly made, well seasoned, and not greasy. The pita was quite chewy which I like. And yes, I love the little carrier (I’m similar to a five year-old when I eat… if it can end up everywhere, it will.) Pairing this with Asian fruits and vegetables was a brilliant idea, the crunch from the sprouts complements the crunch on the falafel, while the oranges adding a refreshing tangy sweetness which was enhanced by the citrus sauce on the side. Light enough for a hot summer day, and filling enough for me. 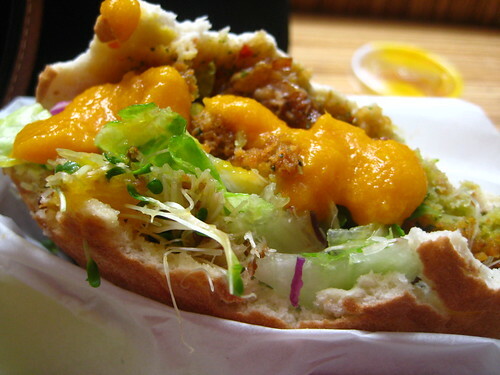 It all seems like such healthy eating, though it’s falafel. No food coma here. Posted by Blondie at 11:45 am, June 2nd, 2010 under Crisp. I had the Crisp Africa based on a ML review and it was awesome! Sounds like I’ll have to try the Asia now, too. That is one FINE looking sandwich. I just hoped it was prepared with clean hands, sans microbes, and in compliance with NYC ‘Health Department’ regulations. Crisp just informed me that the Crisp Asia has been discontinued. Discontinued!?!? Crisp is dead to me.